A few years ago he trained his wide-angle gaze and formidable investigative skills on The Searchers, the 1956 masterpiece starring John Wayne and directed by John Ford. The result was a brilliant look not just at a single film but at how facts about actual cases involving white women captured by Indians on the frontier have been used, distorted, and mythicized. Frankel’s follow-up attempts to bring clarity to a film as it reflected issues of American justice in an age of Hollywood cowardice. High Noon, from 1952, has not kept its luster quite like The Searchers but is still high on the list of emblematic Westerns. At the book’s heart is one of Hollywood’s enduring hot-button topics: the blacklist. The movie’s star, Gary Cooper, won his second Oscar for the role of Marshal Will Kane. The picture was directed by Fred Zinnemann, who went on to collect Oscars for From Here to Eternity and A Man for All Seasons. The big studio system, meanwhile, was changing, allowing for independent companies to make less expensive, more daring films. The producer of High Noon, Stanley Kramer, was a pioneer in forming such a company. High Noon brought together a dream team of talents on a “shoestring budget” in the ultimate collaborative art form. Shifting back and forth from celebrities to film production to politics, the book gets a bit clumsy. Moreover, Cooper, a native of Helena, Montana, was not quite the Western icon that Wayne was. Yet despite his Republican politics he refused to quit High Noon when Foreman offered him an out, while Wayne played one of the pro-blacklist bad hombres, which Frankel details. Nor was Zinnemann Ford’s equal as a director. What’s more, the blacklist has been written about so much in the past half-century that Frankel must work to build up suspense. His pastiche of biography, behind-the-film story, and political history still is intriguing, and occasionally as rancid as some of the HUAC characters. Foreman, conflicted but honorable, refused to name names. He stayed out of prison but he was hounded into moving to Europe, where his marriage unraveled and his life felt unmoored. One nemesis, Martin Berkeley, a hack screenwriter, was a colorful rat who spewed out 150 names but that wasn’t enough to get him any decent screenwriting credits. Kramer turned out to be long on self-regard yet short on loyalty. He forced Foreman out of his company (Foreman did get a hefty severance) and removed his name as associate producer. Kramer’s associate, mogul Harry Cohn, thought the movie was “a piece of crap.” High Noon’s editor, Elmo Williams tried to hog credit for the picture’s eventual success. The most memorable element of High Noon might have been its music. Dimitri Tiomkin, a zany Russian who butchered the English language, composed the movie’s soundtrack. Its theme song, “Do Not Forsake Me Oh My Darlin,’” perfectly outlined the story (the lyrics were by Ned Washington), soared to the top of the charts, and captured an Academy Award. So was High Noon a parable of the Red Scare? Frankel backs away from such a conclusion. 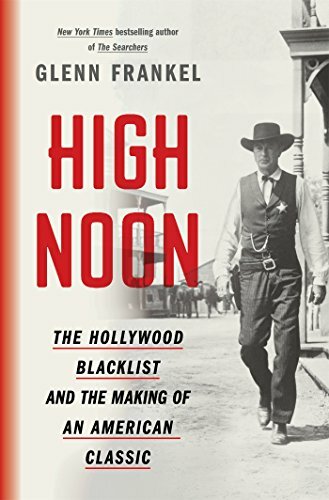 “At a distance of more than 60 years,” he writes, “High Noon’s politics are almost illegible.” Regardless, it was a box office hit that bagged an Oscar nomination for best picture. It lost out to The Greatest Show on Earth, whose subject was the circus.